Warning this guide contains spoilers and possible disturbing content! I made this guide about Team Salvato's upcoming horror game Project Libitina and how it's linked with the story and characters from Doki Doki Literature Club. As you can see in the title, I am also going to talk about secrets and easter eggs that are hidden in DDLC. The first playthrough of Doki Doki Literature Club (or short DDLC) seems like a normal dating simulator. For those who do not know this game or still plan to play it, let me warn you again: This guide contains spoilers and possible disturbing content. So if you happen to dislike Creepypastas and deep stories, you should stop reading this and leave. Play a nicer game like Team Fortress 2, Dota 2 or Human: Fall Flat. 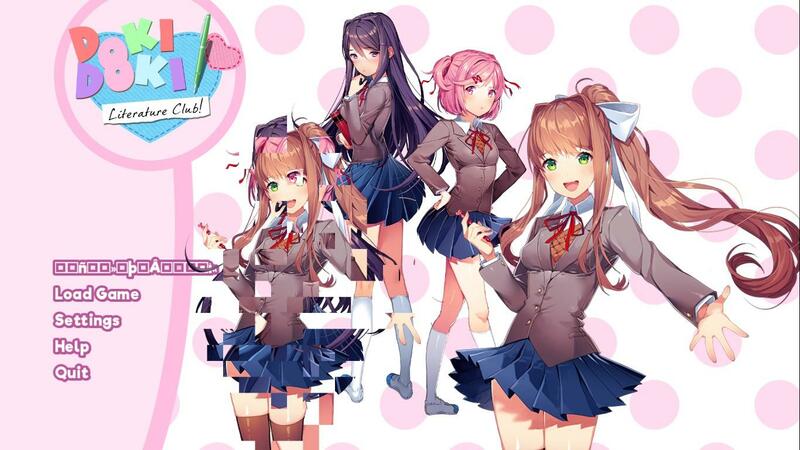 Because DDLC has secretively hidden a horror game underneath it that we will explain in this guide (that's what you came here for right?). What Team Salvato also hid in this game are many easter eggs and a lot of clues to the upcoming horror game that were actually in plain sight the whole time through your second playthrough. If you didn't notice the tag 'Psychological Horror' while visiting the store page of this game and playing through it for your first time, you were probably surprised when Sayori hanged herself. Actually, you know what? This would probably be a lot easier if I just deleted her. She's the one who's making this so difficult. Ahaha! Well, here goes nothing. If it isn't clear for you who wrote this note, it was none other than the club's president: Monika. After a while she realizes that she's in a game and becomes self aware, even messing around with the game files. Which you can already see in the text. If you thought the game is over, you are wrong. In fact, the horror has just begun. Sayori is deleted from the game (by yours truly, Monika) and her character file is gone too. Getting back to the title screen after that scene (that rhymed lol), Sayori is glitched out and can't be seen (except for the glitched images of the other characters that replaced her) and as you probably realized the 'New Game' button changed to some unreadable symbols. That's when Act 2 starts and stuff is really getting messed up. "I probably know a lot more than you think"
On the day shortly before Sayori hangs herself. 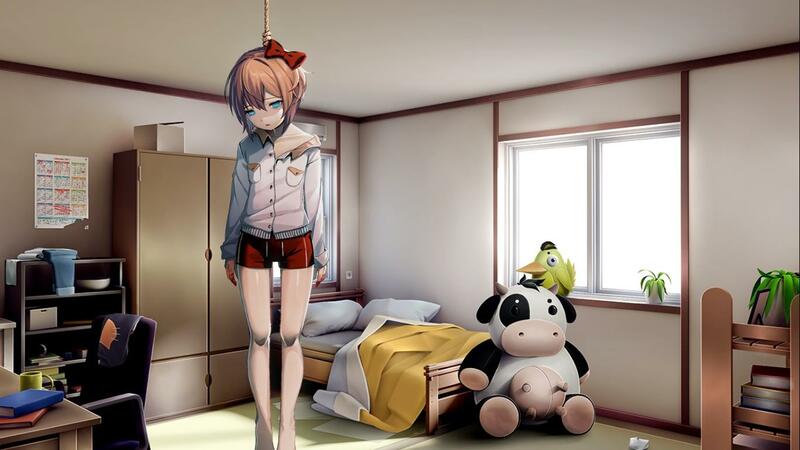 Now that's what a lot of people think,Sayori hung herself. But as we said on the chapter before this,there was blood on Sayori's hands,which must have meant she was trying to loosen the noose or she was fighting someone. Even when you enter Sayori's house and see her hanging there,you can hear a piano playing in the background. Even though the piano is a little slower,which probably means that Monika knows she doesn't have to keep a too close eye on you since she did her job. But she is still there,only more in the backround. That probably is also the reason why Monika knows so much about what's going on. For example,when you go to school on the day of the school festival she tells you that you left Sayori 'hanging',which you probably ignored when you first played it and haven't thought much about it at the time she said it. When looking at the girls' poems,you hear a different version of the 'main' song. It changes individually based on the girl. Sayori's is a more carefree version with ukelele and snaps,Natsuki's a more childlike version with xylophone and recorder while Yuri's is a more sophisticated version with strings,harps and flute. Monika's is solo piano. Nobody else has piano in their version except her. During Act 2 when Natsuki reads your first poem and hates it you'll get a 1/3 chance that her eyes will pop out while reading your poem. 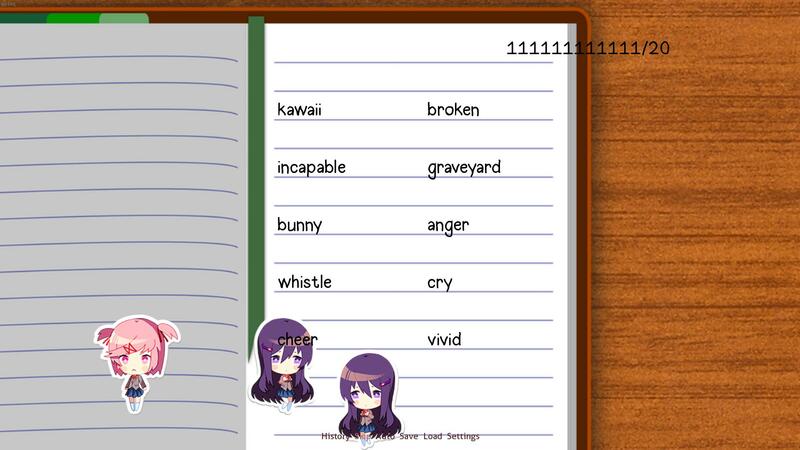 During your first interaction with Yuri in Act 2 when talking about reading a book together with her,her right eye slowly starts flying away from her face towards the left corner of the screen until it completely dissapears off screen. Note:This easter egg does not appear to be in all versions of the game. During the second act, in the third day, there's a 25% chance that during the conversation with Yuri near the closet, Natsuki's eyes will turn into black pixels, her mouth will turn realistic-looking and she will say "Mibulls sailcloth blindsight lifeline anan rectipetality faultlessly offered scleromalacia neighed catholicate". It is still unknown if those words have any possible meaning, or if they are just random words. In the second act, when you face the choice with who you should spend the weekend with, the cursor will forcefully push at choosing Monika. However, managing to choose Yuri or Natsuki will result in the game pausing momentarily before a white screen and a pair of purple eyeballs (resembling Yuri's "obsessive" eyes) appear, staring at you. Unreadable text will then appear at the bottom along with a bunch of "Monika" buttons. Heavy breathing can be heard in the background as the pupils move around like when Yuri's face changed to look similar in another point in the game. Clicking any of the buttons will result in everything returning back to normal and Monika will be excited you chose her. If you try to copy the save files of another act during the second,third or fourth act,a black screen will appear with text "Unable to load the save file" after which Monika will appear and ask you if you're trying to cheat. This scene can be avoided if you copy the "persistent" file from the save folder, which stores information about the current act. 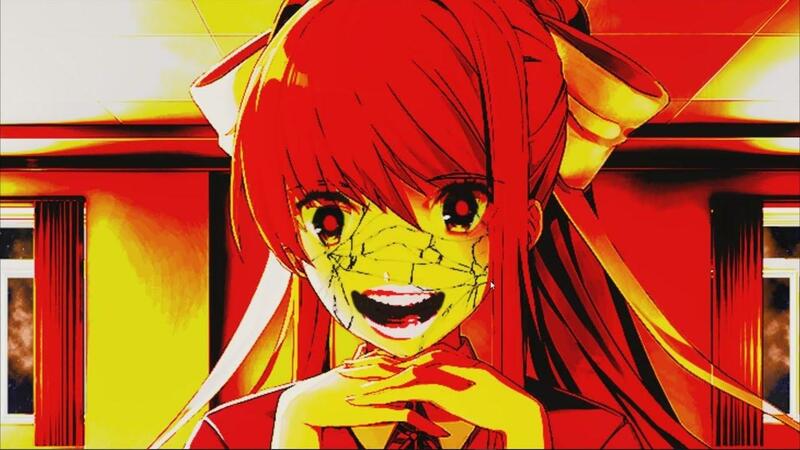 This scene can also happen during the 4th act, and Monika will still appear despite being deleted. 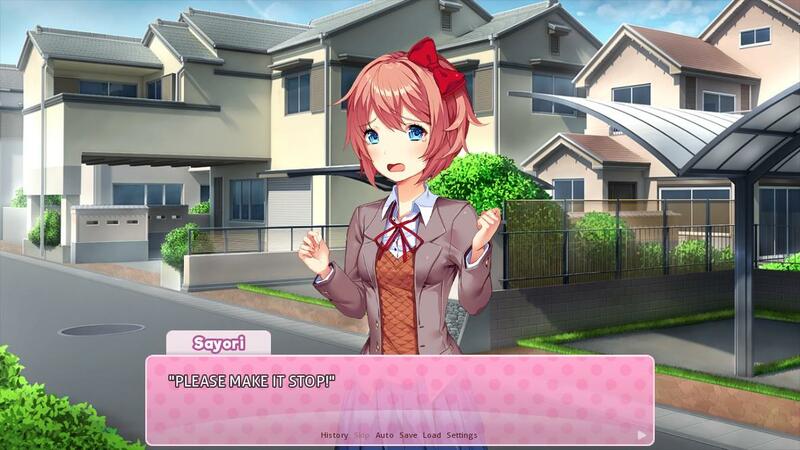 At the title screen when you first pick your name,deleting Monika or Sayori's character file before starting the game will, upon the game's start, result in a scene featuring Sayori first visibly confused and finally yelling, "PLEASE MAKE IT STOP!" 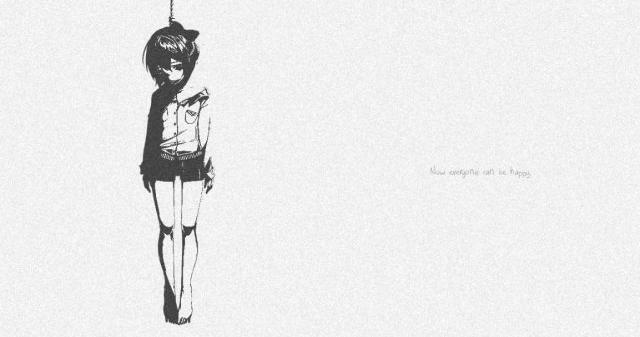 The game will then exit itself, and upon reopening it, a second screen will appear, displaying the word "END" before changing into a black and white GIF of Sayori hanging from a noose, accompanied by an ambient static loop. After 10 minutes pass, the words "Now everyone can be happy" will appear on screen. Yes I literally waited 10 minutes just to get that screenshot. Note: Deleting those characters before opening up the game will skip straight to the white Sayori picture part. 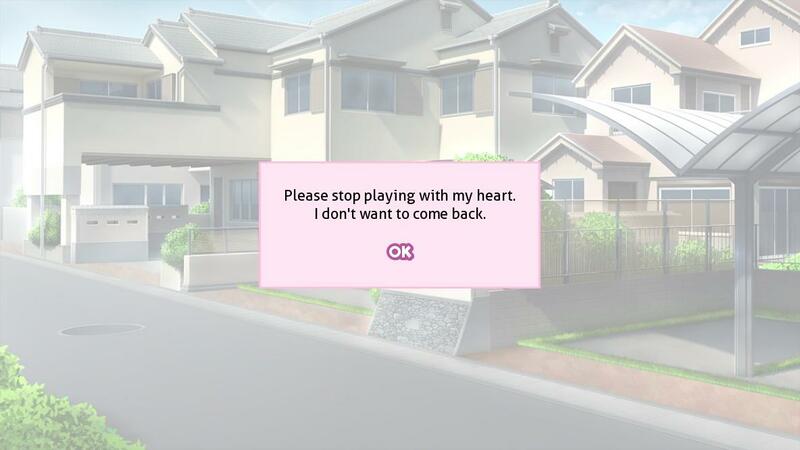 If you try to start a new game in Act 4 with monika.chr being present in the characters folder, Monika will ask you to stop playing with her heart and then delete herself. In Act 3,if you're recording the game with OBS or XSplit during the part where Monika says your real name,instead of that dialogue appearing,she will notice that you're recording her and after a short talk will jumpscare you. 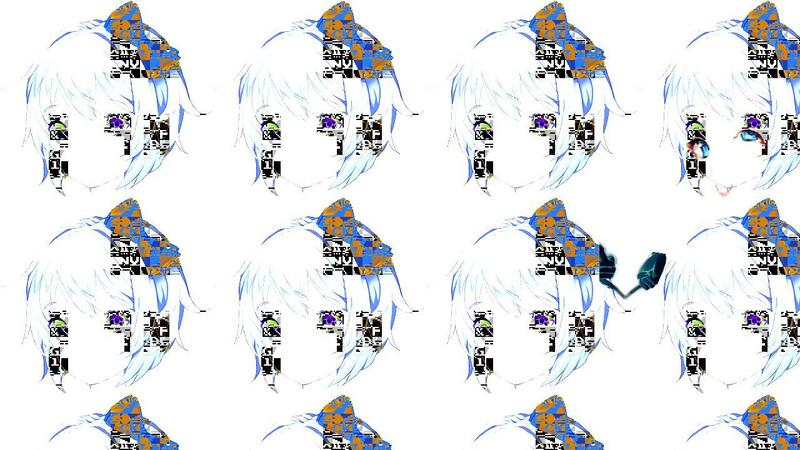 After the poem minigame on day 1 of the 2nd act there's a chance to get a reel of an uncorrupted picture with only Sayori's head on it and distorted,creepy music playing in the background. 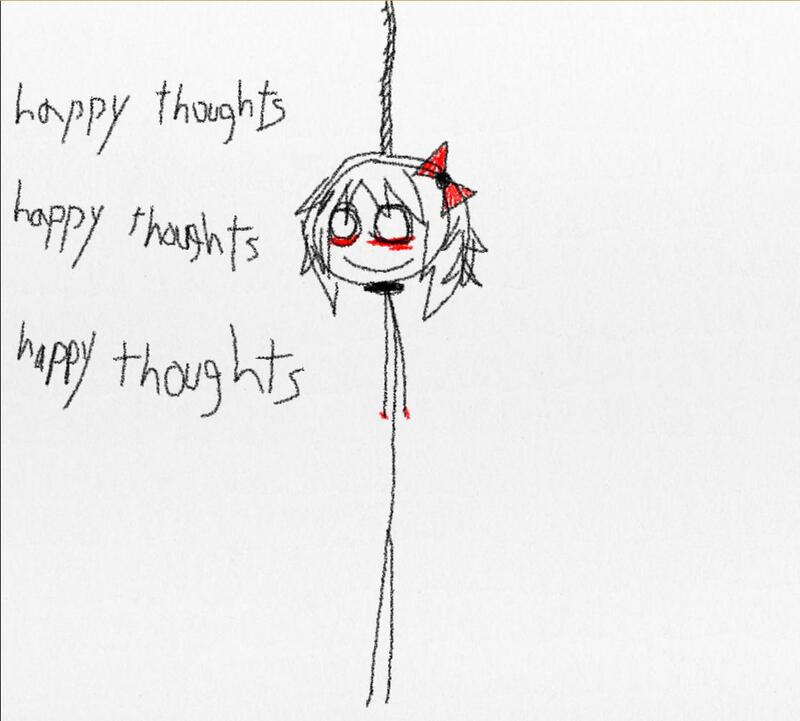 It shows a creepy child-like drawn picture of Sayori hanging herself. 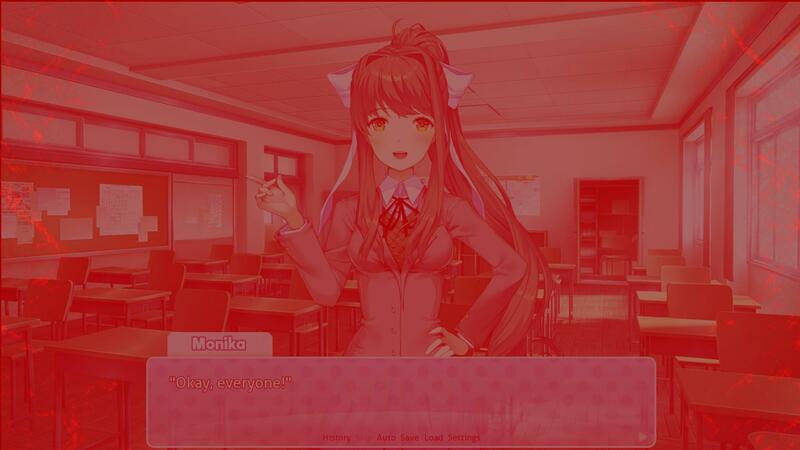 After closing the second secret poem during Act 2,there is a slight chance for a red filter to be applied to the screen. The in-game sounds are muffled and an unsettling soundtrack plays during this. The screen turns back to normal after a few lines of dialouge. After closing the second special poem in Act 2, your cursor will also be replaced with a glitched Sayori head for some lines of dialouge. 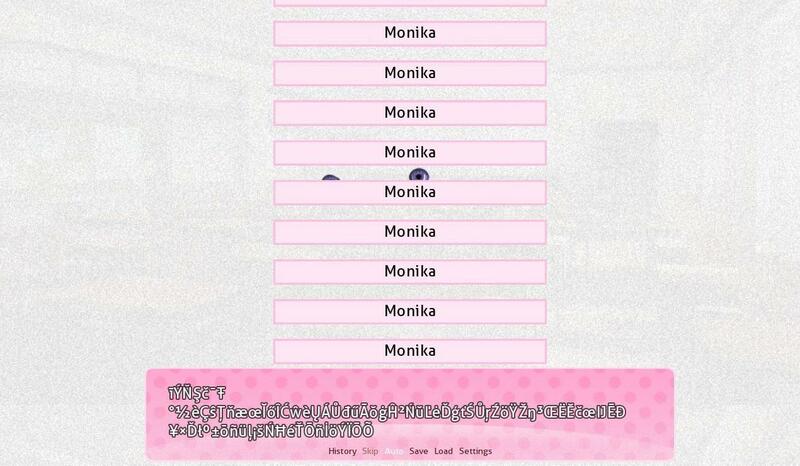 On day 3,when writing another poem,there is a slight chance for Monika to jump up from underneath the screen when clicking a random word. 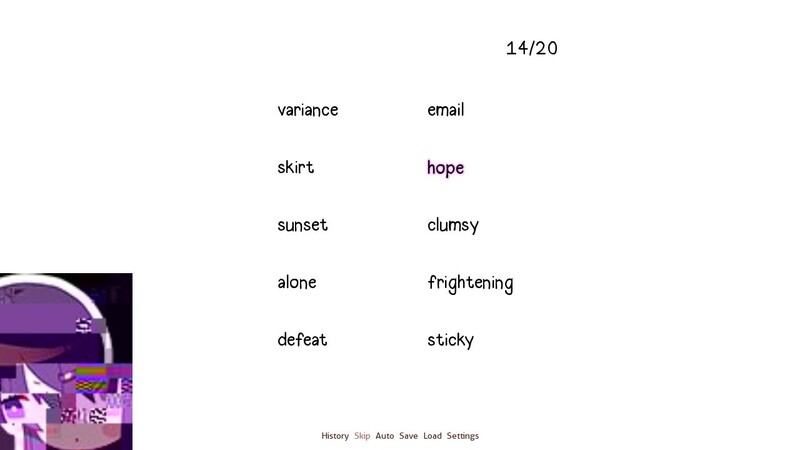 There's a 50% chance for a glitched word during the poem minigame on day 2 or 3. Clicking it will distort the minigame and glitch out,with a glitched part of Yuri's head in the lower left corner. 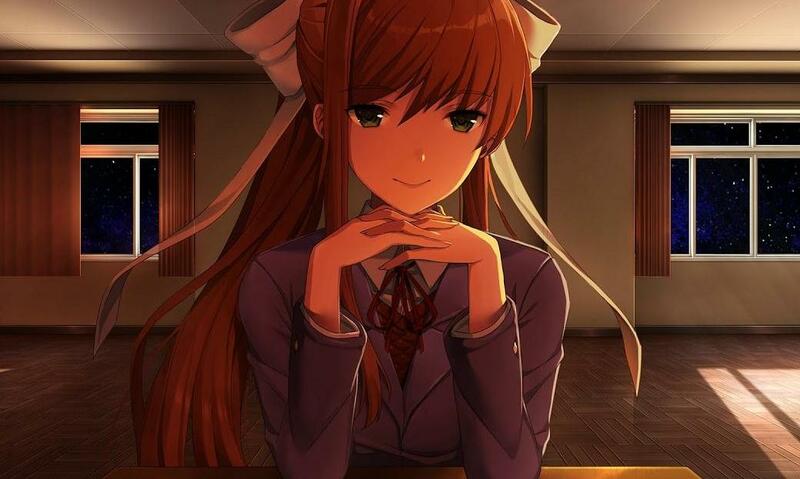 When going into the menu during Act 2 there's a 2% chance that this picture of Monika will flash for a second. 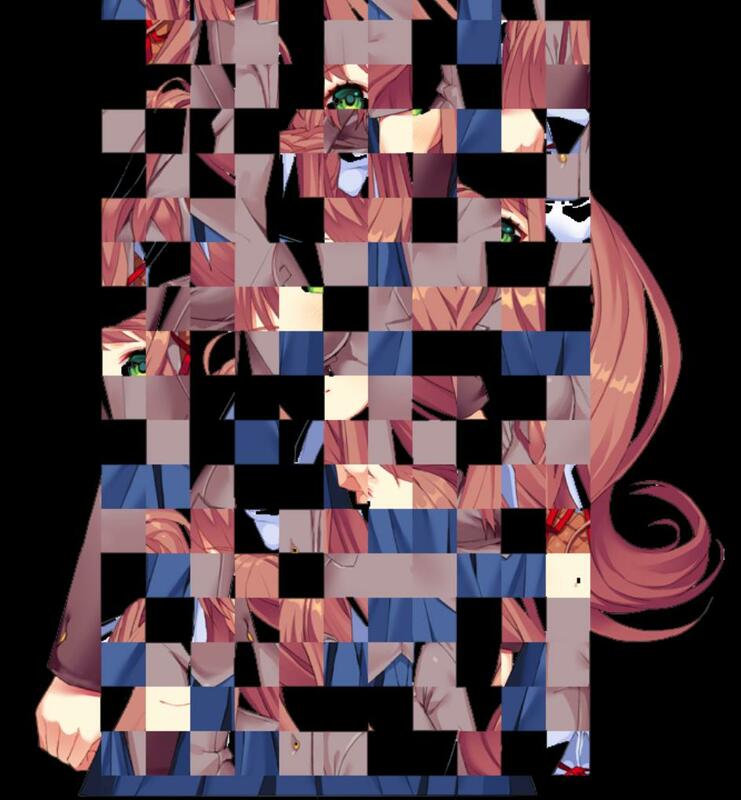 Distorted music is going to play in the background and all the buttons and background are missing so you're only option will be to close the game with a short flash of the screen zooming into Monikas eyeless face. The image switches between different color schemes before the game returns back to normal. Note:This will only appear if you didn't see the "hxppythxughts.png" on the 1st Day of Act 2. It's pretty common that Yuri greets you on the 3rd Day of Act 2 without a head and a glitched body. To the right you can see random numbers and letters which is base64 language. Base64 is a group of similar binary-to-text encoding schemes that represent binary data in an ASCII string format by translating it into a radix-64 representation. The realization must have taken me an entire year. A year since our escape, our freedom from between the stained walls of that unholy establishment. What does it mean to escape, if the escape fails to unchain the bonds that shackle us in the first place? What purpose could this empty world possibly hold for us, a handful of damaged goods? With freedom, we sought purpose - and what we found was only realization. Realization of the sad pointlessness of such an endeavor. Realization that freeing our bodies has no meaning, when our imprisonment reaches as deep as the core of our souls. Realization that we can not pursue new purpose without absolving those from which we ran away. Realization that the farther we run, the more forcefully our wretched bonds yank us back toward their point of origin; the deeper our shackles dig into our callous flesh. "There's a little devil inside all of us." Beneath their manufactured perception - their artificial reality - is a writhing, twisted mess of dread. Loathing. Judgment. Elitism. Self-doubt. All thrashing to escape the feeble hold of their host, seeping through every little crevice they can find. Into their willpower, starving them of all motivation and desire. Into their stomach, forcing them to drown their guilt in comfort food. Or into a newly-opened gash in their skin, hidden only by the sleeves of a cute new shirt. Such a deplorable, tangled mass is already present in every single one of them. That's why I choose not to blame myself for their actions. All I did was untie the knot. This was probably written by Monika,who else did you think it'd be? If you start Act 2,the letter will appear as a .txt file labeled "CAN YOU HEAR ME". I CAN'T DO ANYTHING. NOTHING. No matter how many times you play. It's all the same. It would be really, really easy to kill myself right now. But that would mean I don't get to talk to you anymore. All I want is for you to hate them. Why is that so hard? This was obviously written again by Monika,described by the quote:All I want is for you to hate them since we know that she has been messing around with the girls personalities,to make you hate them and only love her. This poem is from Monika trying to reach out to the player. This poem is probably written by Yuri hence we got to see that she cuts herself in Act 2. Another theory is that Monika wrote this and the blanked out name that may be saying Yuri but it is just a theory since Monika is irrelevant to cutting herself. 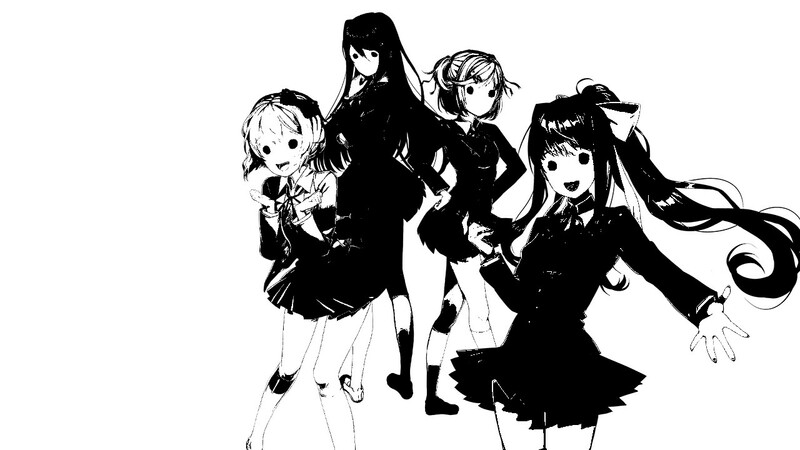 The blacked out name could also be Elyssa,a character from the game Team Salvato is working on,but we're not sure. Maybe we are going to mention it in another part/chapter of this guide. Just stare at the dot for some seconds (like 5-10 seconds). To reveal a message, which is probably from Monika. "Before distaster could happen,a third party intervened with her programming"
It is unclear in this poem who is talking and who the unreconizable person is. Seems like a normal poem doesn't it? In fact,this secret poem was written by Natsuki,since we know that she's getting abused by her father.By the quote:I like when papa is too tired for anything she probably means that her father has been drinking and when he falls asleep she is able to move freely without beeing judged by him. 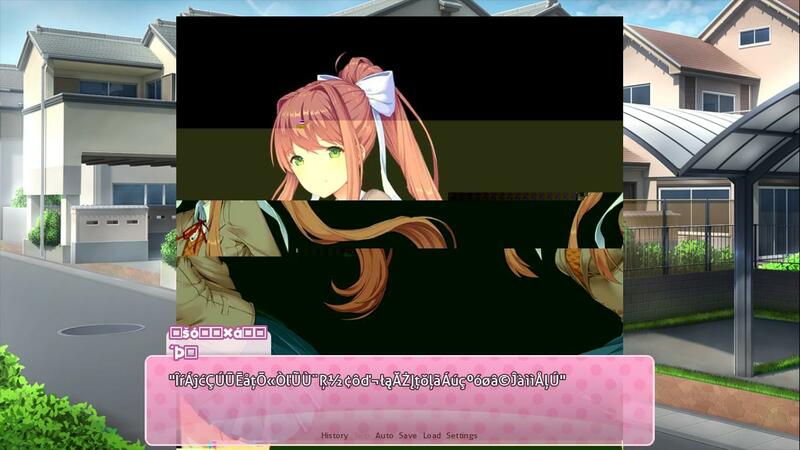 Pretty common to get this too,just a glitched out Monika picture. Now this is an interesting one, all you can see on this picture is blacked out text and some letters in between spelling the sentence: "Nothing is real?" Irregular heartbeat. Heart palpitations. Arrhythmia. I search and search. Eyes scanning everything I can find on their symptoms. What is this? Shortness of breath? Chest pain? Dizziness? No. This is all wrong. Elyssa's syptoms are nowhere near this simple. I've seen it twice now. The screams of pain. Sickeningly pale skin. Vomiting blood. There is no other explination,other than that Renier's explinaton was a complete and utter lie. This can't all be coincidence. It's not possible. I don't know how much of this Renier is behind. But I do know this: There is something horribly wrong with this family. And I accepted the invitation to become a part of it. I can hear Elyssa screaming through the walls now. I listen helplessly. Renier said that he would be with her shortly. Is he in her room now? Why is she screaming even louder than before? This text seems to be a spoiler to the upcoming game Team Salvato is working on. as if it were an extension of my sense of touch. that screams to resist this uncontrollable pleasure. But I can already tell that I'm being pushed over the edge. Many people have been asking what the yellow stain is on the sheet and let me tell you this once,Yuri cut herself while writing this poem,that's why the blood stains are there.She also touched herself while writing it so you can probably think of what the yellow stain is suppose to represent. 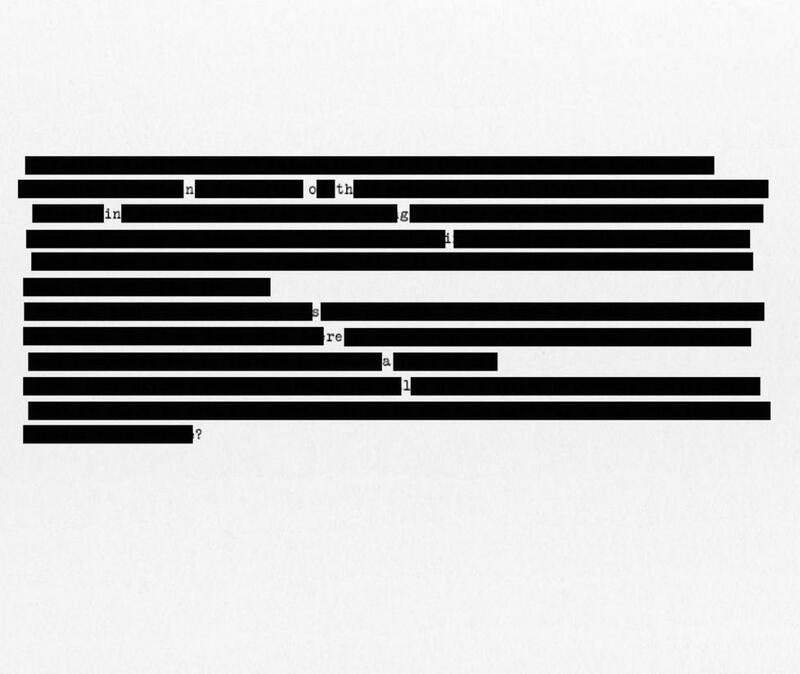 Yuri's file was the easiest to crack since it's again just a pile of Base64 text. Decoding it will give you this story,a creepypasta that the Game director,Dan Salvato,wrote by himself. To see the content of this file you have to rename it to a .png file (monika.png),which will result in a picture of a flaming ring with a square in the center.Which contains black and white pixels. This is my story. It's time to be a ♥♥♥♥ing hero. We can clearly tell that this is written by Monika due to the quotes:"You obviously already know my name" and "You've been watching me for a while now". This women has never been seen before in DDLC,so it might be a character from Project:Libitina.Maybe it's Elyssa,the one we heard from in the last secret poem.But there's no proof yet. Yuri tells you about a book she bought you as a gift. It's called the portrait of Markov and has a ominous-looking eye symbol on it's cover. The book may be a reference to to the Russian mathematician Andrey Markov, known for creating the stochastic processes known as Markov Chains and Markov Processes. This "Markov process" is the testing of certain variables and the states in-between the variables that are tested, like the state between birth and death or the state between fertilization and birth. Now as you probably noticed through-out the files and some of the secret poems that there's been mentioned a Third eye.And I am 100% sure that the third eye theory is connected with the portrait of Markov theory.Because both have to do with the new game. "....basically,it's about this girl in highschool who moves in with her long-lost younger sister...But as soon as she does so,her life get's really strange.She gets targeted by these people who escaped from a human experiment prison....And while her life is in danger she has to desperately choose who to trust". "Basically it's about this religious camp that was turned into a human experiment prison...all the people trapped there have this trait that turns them into killing machines that lust for blood.But the facility gets even worse and they start selectivly breeding people by cutting of their limbs and affixing them to...."
Then she cuts off.But that's a lot of information for just a little book,but the reason for that is,that book isn't just a little story.It is the story of Team Salvato's upcoming game!But in-fact,it might be possible that the characters from DDLC are also characters in this new game,since we know that Monika said in her png. 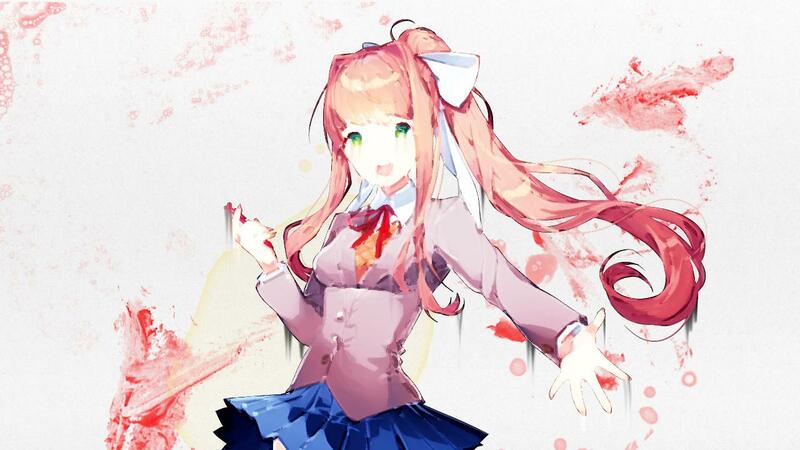 file text that there's something you as the player can't stop.Something that has killed everyone.Maybe that's the reason why Monika turns self-aware,because she realizes that she has been put into the wrong game.Yuri also mentions a trait in her book that has turned everyone into killing machines. Throughout the literature club and it's files the third eye has been mentioned several times,explaining the lust for blood and killing. All of that should point out that Team Salvato's new game is about human experimentation,researching a phenomenon that includes uncontrollable bloodlust. Going back to the monthly report we got out of Sayori's file,it seems that this experiment has also been tried out on young Libitina.It was all about activating her third eye,the lust for blood and killing.We can see that Libitina's third eye activation test turned out to be successful,but she was then unable to suppress it.Which means that her third eye is still active. 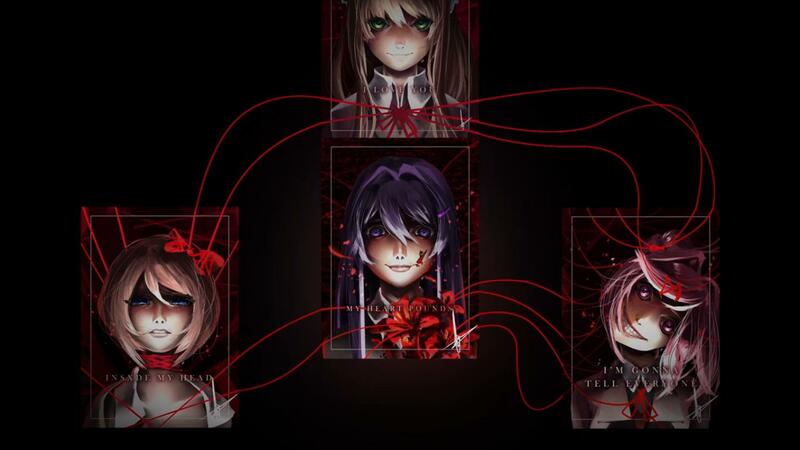 Now the theory here is,what if Libitina is one of the 4 girls in DDLC?And if so,isn't it obvious who it would be? We can see that Libitina is 3 years old in 2004,now in 2017 she should be 17 years old since she was born on the 1st of June,2001 and the game was realeased on 22nd September 2017.The oldest club member in the literature club is 17 years old,in the examination report we can also see following behaviours of Libitina:Twitching,vocal tics,biting,epiphora,vomiting,screaming,harm to examiner,harm to self,misplaced laughter. She seems to be the only one with the right age reange to be Libitina.Throughout the 2nd Act,Yuri's personality also takes immense changes. We can see her eyes twitching and the urge for her to vomit after a certain scene.She's laughing like a psychopath,we can also see her cutting and stabbing herself in Act 2. 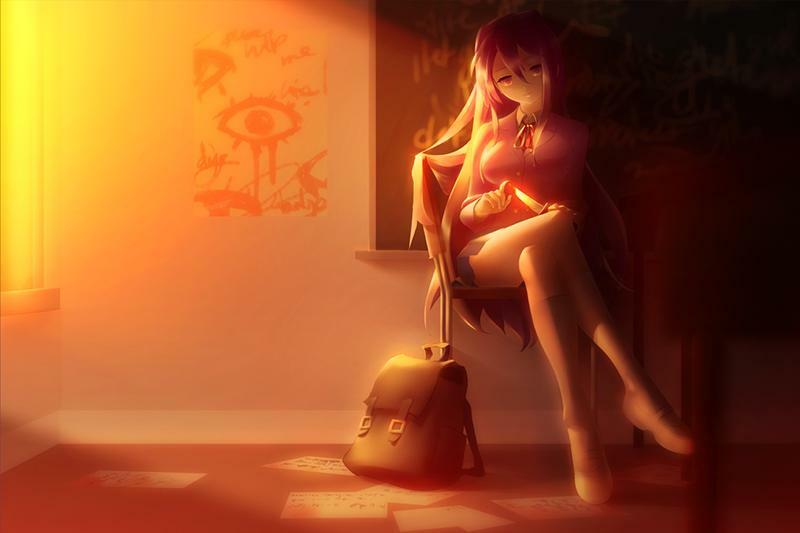 Here we can see Yuri, playing with a knife in the clubroom during sunset. I don't think the name "uhinged" really fits to this picture because Yuri seems very confident for an unhinged person. But what's more important in this picture, is the poster next to her. It shows an eye and the words please help me written around it. That must mean that the portrait of Markov is suppose to represent her story. The story where Monika will probably be the hero and Yuri the villian. So the final question is: Is Yuri really Libitina? And if so, who is Elyssa? Maybe her long-lost sister? Does Project Libitina even have anything to do with DDLC?